month or so ago, Microsoft argued that ODF had won. It tried to escape this comment later, but Erwin thought (he wrote so in his last blog post at Sun Microsystems) that it was part of Microsoft's plan to get closer to ODF (and maybe poison it more successfully from the inside). That too is something that got Microsoft’s management pointing at Boycott Novell. They were concerned enough about our arguments to rebut, not to ignore. Anyway, there’s a bit of a deja vu now that the Microsoft-faithful Alex Brown [1, 2, 3, 4, 5, 6, 7, 8, 9, 10, 11, 12, 13, 14, 15, 16, 17, 18, 19, 20, 21] publicly announces that ODF is in the lead. Alex Brown was convenor of the ISO/IEC DIS 29500 (OOXML) Ballot Resolution Process, and is convenor of the group overseeing its maintenance processes. He has recently been nominated to represent the publishing industry on the panel advising the British Library on handling digital submission of journal articles. Why would he issue such a press release? Why bother? Why go out of his way? Either way, whatever Alex Brown’s motive was with his new press release, it’s akin to that “ODF has clearly won” remark from Microsoft. It makes an illusion of apathy and reduces scrutiny. It’s a dangerous apathy that neutralises hostility. Microsoft does this a lot when invading "Open Source" (if you reject their posturing they call you a “Microsoft hater” or use some other insulting labels that paint you as a fringe lunatic). You also have to wonder why Brown still recommends that the British Library should use Microsoft’s OOXML. It was pointed out earlier today. Unlike ODF and OOXML, however, I am beginning to believe the Directives have got to a state where they cannot be redeemed by evolution and amendment. It may be time to start again from scratch. Let’s face it. OOXML is been a farce from start to finish. As The Inquirer put it a couple of days ago: The customer counts for nothing. And as far as compatibility is concerned, you need not look further than Microsoft. It has been investing billions in its new wannabe-open format, which is actually a poxy pile of unstable zipped XML files – various bugs have been reported, especially concerning Excel. We should also mention that the document describing the standard is a six thousand-page monstrosity, which compares quite sadly to the less than one thousand pages description paper for the OpenDocument format. If ODF has truely won, what does that mean? Why do they keep pushing OOXML in the ISO? Personally, I don’t feel like ODF has lost or won anything, so what do they mean by that phrase? What has been won? 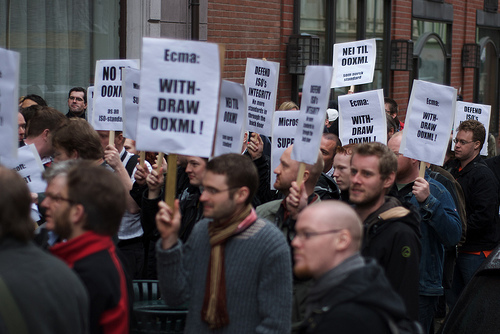 I don’t feel like there was ever a confrontation between ODF and OOXML.It was just something between standard experts and Microsoft employees and partners. Are they admitting their defeat of their bad behavior? NO. I feel like this is another defiant strategy against goodwill and common sense.